The nation took great pride in the success of 2012 Olympic Games, and REIDsteel were no different. With fear before the games commenced that the huge crowds would draw a great terrorist threat to both the capital and the cities and towns throughout the UK holding events, it was imperative that security was top priority and that our nation was protected from any potential disasters. Extensive testing has been carried out and gates have been approved and tested to BSI PAS 68. The systems were originally designed for military use but this low cost system which does not require any foundation works has been deployed around airports, sporting events energy facilities and commercial facilities across the UK. REIDsteel are proud to have played a large part in the security of the millions of people who attended events throughout the UK with our patented Dragons teeth and bollard type gates. We supplied 51 gates from Weymouth to Newcastle to the perimeter of stadiums and arenas to eliminate any threat from a terrorist vehicle with on board explosives. Working alongside main contractor FM Conway the gates were supplied and installed to the strictest of deadlines and to the complete satisfaction of LOCOG. This system can be used as a temporary or permanent security system which can be covered with company logos and colours to incorporate the aesthetics of the gates. We are glad to have played our part in London 2012! 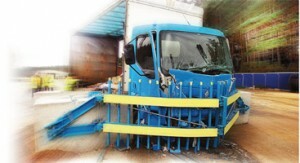 REIDsteel Supplier of Hostile Vehicle Mitigation perimeter security gates (Olympic venues) to the London 2012 Games.